Address : Upper Drumcondra Rd. The McEniff Skylon Hotel is situated half way between Dublin airport and Dublin city centre. A smart hotel, the McEniff Skylon Hotel is an extremely popular hotel due to is great location and it's friendly, warm atmosphere. 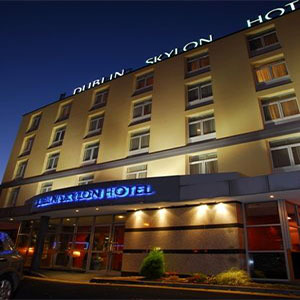 The BEST WESTERN Dublin Skylon Hotel is Located in lovely Drumcondra village, only a stone's throw from the beautiful National Botanical Gardens and the historic Glasnevin Cemetery. While visiting the Dublin Skylon Hotel - as it is located between Dublin's city centre and Dublin Airport- make sure you visit the city's top attractions including:Book of Kells, The Jameson Distillery, Christ Church Cathedral, The Chester Beatty Library are all within short distance of the hotel as is the stunning Sandymount Village and beach. the Skylon bar reflects a warm Irish welcome and home of a truly great pint. So whether to enjoy a Guinness, a craft beer from our newly stocked Irish BRU beers, or a glass of wine or a fun evening with friends, the Skylon Bar & Grill is perfectly located to provide a lovely evening. The great entertainment line up at the Skylon Bar & Grill, there is live music in the Skylon Bar & Grill every Thursday, Friday and Saturday evening with legendary band Tropical Storm performing on the last Saturday of every month. Our fantastic Jazz Lunch Sunday makes the Skylon Bar and Grill Dublin?s best Sunday lunch venue for all the family. Click here to view more upcoming live entertainment! The Dublin Skylon Hotel is the perfect dining location. Head Chef delights in preparing the highest quality food using locally sourced ingredients. The cosy lobby is the ideal venue for a lovely afternoon tea, our restaurant is perfect for a delicious dinner with friends, and our bar and grill simply a great place to relax and have fun. We have lots of options and menu plans to choose from so call us today and let us help you design the perfect menu for your event or family occasion. Skylon Hotel is perfect place to stay if you are attending the sport venues to watch live match in places such asAviva Stadium or Croke Park. Also you can relax and watch the major sporting events at the hotel as they are televised - golf, soccer, rugby and GAA . Skylon Hotel is the place for your meeting, conference and events. It is located in lovely Drumcondra with beautiful amenities, bars and restaurants on our doorstep, 110 carpark spaces as well as an express taxi/bus lane outside our door we can have you to the airport in 12 minutes guaranteed, or into the city centre in 15 minutes. Click here to view our Corporate facilities! Our rooms at the Skylon Hotel are spacious, calming, comfy, quiet and cosy private space where you can relax from your days activities. Whether you are just back from supporting your favorite team at Croke Park or an amazing gig at the 3Arena, our elegantly designed rooms will provide you with a real sense of warmth and welcome for a restful night. View the type of our rooms and the facilities in each type!